Is Stockman right about deficits, after all? Many Americans interested in economics will recall David Stockman as the controversial White House budget director who swam against a tide of increasing deficits during Ronald Reagan’s administration in the first half of the 1980s. Ultimately, while Reagan supported many high-profile cuts to social benefits and regulatory budgets, he vastly increased military spending and cut taxes drastically, leading to deficits that disappointed fiscal conservatives. Stockman has an op-ed article in yesterday’s New York Times blasting what he sees as weak efforts by the president and congressional Republicans to come up with long-term plans to cut deficits. He disagrees with the Ryan plan’s focus on cuts to programs that help the poor and Obama’s emphasis on ensuring that the rich pay their fair share. In Stockman’s mind, these approaches to budget cuts leave the federal government’s main fiscal problems unaddressed but go down well politically. One should take note that while Stockman’s alarms of more than 25 years ago went largely unheeded, no serious U.S. fiscal crisis materialized, though deficits reached nearly 6 percent of GDP in 1983. On the other hand, unemployment touched double-digit levels early in Reagan’s tenure, making high deficits nearly inevitable and certainly justifiable from a policy perspective. Moreover, numerous other serious problems arose largely as a result of Reagan’s economic policies, including his attack on the “safety net” of social programs for the poor. Finally, we wish to respond to the fiscal disaster scenario that Stockman presents in today’s article. Levy Institute macroeconomists and other strong proponents of Keynes’s theories have argued in recent years that the United States should run deficits in the amounts necessary to ensure full or nearly-full employment, without fear of bankruptcy or other affordability issues connected with high deficits. We argue that unlike individual U.S. states and members of currency unions, the U.S. federal government can run deficits indefinitely without becoming “insolvent” in any sense or being forced to default. The government has this ability because the United States uses paper money that is not convertible to a fixed amount of gold or foreign currency. Reading Stockman’s article, it appears that he might not completely disagree with these views. He observes that the Fed and other central banks have been buying huge amounts of dollars, in essence using their printing presses to provide the real “financing” for large portions of the U.S. deficits. We have noted the success of these routine operations in recent years, observing that interest rates paid by the U.S. government remain extremely low, even as it has borrowed amounts equivalent to approximately 10 percent of yearly national output. Stockman does not miss this fact, but argues that the Chinese central bank will soon reduce its purchases of Treasury securities in order to control domestic inflation, and that the Fed will also be forced to reduce its open market purchases in order to avoid destroying the value of the dollar. Then, in Stockman’s view, the game that he called into question decades ago will be over. We certainly concede that the use of a sovereign currency cannot be counted on to overcome fiscal problems unless the issuer of the currency is willing to allow its value to change vis-à-vis other currencies. In the case of the United States at the current juncture, this would hopefully involve substantial real depreciation of the dollar against the Chinese currency, known as the renminbi or yuan. We have advocated such a currency depreciation for some time, though Saturday’s blog entry showed that the U.S. dollar may in fact be undervalued relative to some other important currencies. So we do not imagine that the Federal Reserve and the U.S. Treasury possess any magic powers to defy the laws of budgeting that Stockman himself does not acknowledge in his article. The main difference between Stockman’s views on this issue and ours appears to be that Stockman opposes further declines in the U.S. exchange rate or believes that current budget plans would result in far more depreciation of the dollar than we anticipate. From a political standpoint, he believes that the Fed will agree with him on the need to support the value of the dollar, even if such a defense results in greatly increased interest rates. Hence, in Stockman’s view, the Fed will ultimately be forced to accept extremely high interest rates as a result of the high deficits of recent years, making mortgages, business loans, and so on unacceptably expensive to U.S. borrowers. In this sense, as Stockman sees it, the Keynesians will finally be proven wrong. As of now, we feel that the overall value of the dollar may need to fall further and that while rock-bottom interest rates cannot cure the economy’s main problems, they remain desirable for many reasons. A dollar crisis could conceivably unfold, but such an event would not occur without a confluence of multiple adverse events, with the federal debt constituting only a minor factor. (Some examples of the kinds of events that could somehow precipitate a currency crisis would be a big natural disaster, a crash in another key financial market, or an economic depression.) Hence, the fiscal issues that Stockman sees as crucial should not necessitate cuts to programs like Social Security, Medicaid, or Medicare that otherwise contribute to the nation’s well-being or tax increases on families and others with modest incomes. In holding these views, we disagree with most U.S. “fiscal moderates.” Nonetheless, Stockman’s op-ed piece does a good job of establishing some key points, especially the unfairness of the Ryan plan’s attacks on domestic, discretionary, nondefense spending. Who has the lowest labor costs? Floyd Norris has an interesting column in this morning’s New York Times. Earlier this week, I was getting ready with some observations similar to his, though I am sure I could not have done as good a job as he has in getting across the gist of the problem and presenting some evidence. Essentially, Norris shows that since the introduction of the euro in 2000, products from the countries now in fiscal crisis have lost competitiveness relative to German products in international markets. Norris presents data on competitiveness. His data is similar to the series depicted in the chart at the top of this post, but the data above are real exchange-rate indexes. The lines in my chart compare the competitiveness of various economies’ exports, taking into account not only differences in unit labor costs but also the values of their currencies relative to those of their trading partners. Norris’s graph and my own feature data from different economies. 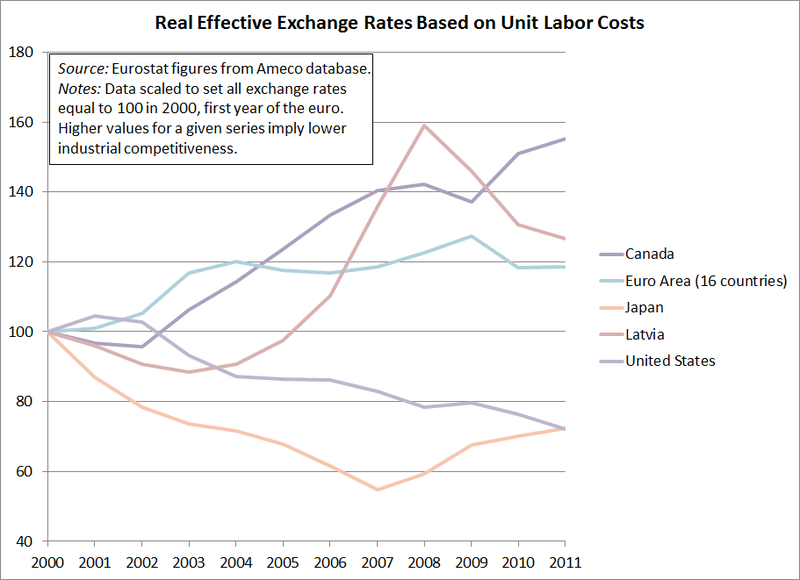 Norris’s point is that Germany is an big exporter partly because it has reduced labor costs relative to its competitors. Meanwhile, according to Norris’s theory, the peripheral countries of Europe, such as Greece, Ireland, and Portugal, have become less competitive, as their labor costs have risen relative to those in Germany and other “core” European nations. And because of the common currency, these higher-cost countries cannot use a devaluation to regain competitiveness. As all acknowledge, the issues involved are complex. One key critique of the current approach to policy embodied by the European Central Bank and European Union rules is that this game clearly has winners and losers, mostly the latter. Norris’s graphs show increasing trade deficits in Italy, France, Spain, as well as the aforementioned troubled economies. While there is no reason that all countries must lead at once, someone, in either government or in industry, must hire workers to produce goods or services if employment is to be increased. Current bailout agreements and big debts are leading to drastic cuts in government employment and wages, even as they bring protests from opposition parties in countries called upon to help fund bailouts. This has contributed to a situation in which unemployment is extremely high in much of Europe, while all are focusing on the need to cut government spending, seemingly ruling out new or enlarged Keynesian public works programs. However, it must also be said that the notion of cutting wages and benefits is also hard to swallow for most Europeans. The countries currently in deep crisis are not known as having high real wages for rank-and-file workers. Also, wage cuts have a tendency to undermine domestic demand for consumer goods, but cannot accomplish the complex task of making a country’s exports competitive in foreign markets. This is doubly true at a time when so many countries are attempting to cut production costs at the same time. Wage cuts do not reduce standards of living if they are accompanied by cuts in domestic prices. However, deflations have a tendency to make it more difficult for consumers and governments to pay off debts, which are mostly for a fixed amount of euros. Also, most deflationary policies tend to reduce economic growth and are appropriate only when the economy is booming and inflation is high. This is one of the key problems with the “new Keynesian” view—held by many economists—that rigid or “sticky” wages set in union contracts, etc., are a key cause of unemployment during business-cycle downturns. There is much discussion of these issues on the web these days. Jeffrey Sommers and Michael Hudson, who holds an appointment at the Institute, have pointed out in a number of articles this year (such as this one) that the Latvian economic-policy model, which involved spending cuts and other efforts to regain competitiveness, has not been as popular in Latvia itself as some commentators have implied. Moreover, recent policies in Latvia have led to large-scale emigration, while failing to bring strong economic growth, in the aftermath of a 25 percent fall in output. 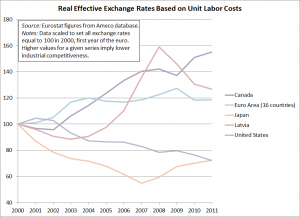 (Latvia’s real exchange rate is among those shown in the chart above.) 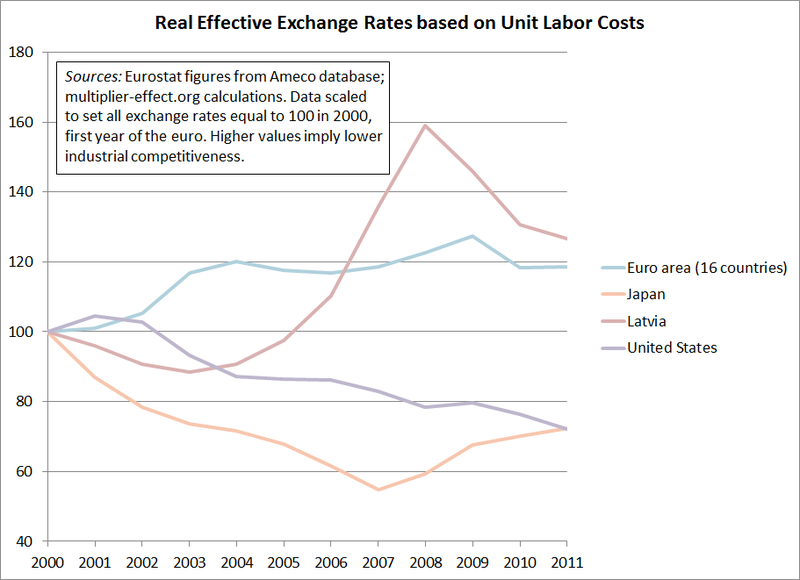 Charles Wyplosz analyzes data similar to those shown above and in Norris’s New York Times column and comes to the conclusion that differences in labor costs are fairly small—especially considering the likely accuracy of the data—and are not crucial to current problems in Europe. Last month, Alejandro Foxley of the Carnegie Endowment offered a more sanguine view than Sommers and Hudson of events in Latvia, while attributing many European problems to the rapid deregulation of financial markets and the rush to the adoption of the euro. He sees the latter process as having brought about an unsustainable boom in financial investment, property values, and consumption spending in many currently struggling economies. We disagree with many of the arguments in these articles. They describe a situation that differs in many ways from the current one here in the United States. But the authors’ analyses are helpful to economists like me who lack intimate knowledge of the countries involved and their economic issues. While European countries should certainly not attempt to reduce wages across the board, policymakers there are in a position in which issues of excessive public debt are very real. Hence, the lessons for the United States, with its dollar-printing machine, are not always straightforward. But also, as the figure above suggests, the United States also has little reason to worry about excessive wages relative to those in the average industrialized country. Update, April 25, approximately 8:10 am: I have revised the chart to include Canada, a major trading partner of the United States. Also, I made minor clarifying edits to the text used in the post and figure. 20th Annual Hyman P. Minsky Conference about to begin! Many Levy Institute scholars and staff members are in New York City for this year’s conference on the late Institute scholar and author. Breakfast should be ending now, with the conference about to begin. The conference’s theme is “financial reform and the real economy.” More information about the conference, including the program, are available at the conference page on the Institute’s website. Update, approximately 3 pm, April 13: The first audio from the conference has now been posted to this page on the Institute website. Now available there is audio from the conference’s formal opening and from the first session. You can choose among recordings of Leonardo Burlamaqui, Dimitri B. Papadimitriou, Jan Kregel, L. Randall Wray, and Eric Tymoigne. The conference ends this Friday, April 15. 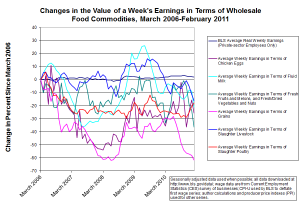 How much food will a week’s earnings buy? The lines for various commodity groups begin on the left side of the figure at a level of zero percent for the March 2006 observation. Each subsequent point on a given line shows the total percentage change since March 2006 in the amount of one type of farm product that can be purchased at the wholesale level with the average weekly paycheck. The dark blue line that appears nearly flat shows average real (inflation-adjusted) weekly earnings as reported by the government. The Bureau of Labor Statistics (BLS) uses the consumer price index (CPI-U) to deflate this series. The line shows that the purchasing power of wages for a typical job has increased by only about 2.2 percent over the five-year period shown in the figure. Moreover, ground has been lost since early last fall, when wages were as high as 3.3 percent above March 2006 levels. 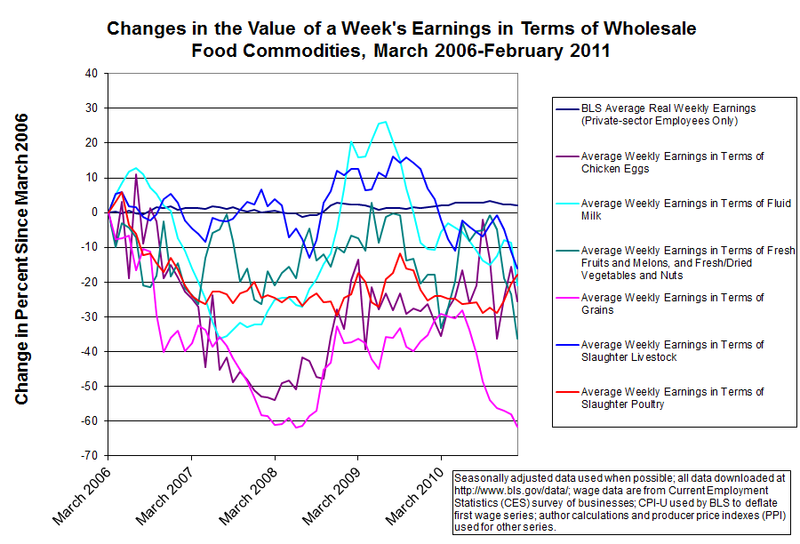 The other lines in the figure refer to average nominal weekly earnings deflated by various wholesale food price indexes. Each line represents a different type of agricultural commodity. Since wholesale commodity prices tend to rise and fall a great deal more than most consumer prices, the lines representing earnings in terms of food commodities appear much more volatile than the blue line representing overall real earnings. I have tried to include most of the foods that are crucial for U.S. retail purchasers, resulting in the use of 6 of the 8 main BLS commodity indexes that fall under the broad “farm products” category. One can think of the resulting real wages conceptually as the living standards of workers who for some reason use their entire paychecks to buy only one type of farm commodity. All 6 lines show losses of purchasing power since the start of the time period covered by the graph, reflected in observations at the right side of the figure that lie below zero percent. One example is grain purchasers, who have fared worst among farm-product buyers, according to my chart, suffering a 61.6 percent loss in the grain equivalent of a typical private-sector paycheck since March 2006. Many observers believe that the current commodity price run-up has resulted from an upturn in economic activity that began roughly at the official end of the last recession, while others blame adverse weather trends due to global climate change. Both of these explanations are likely to be of some merit. Recently, Bank of America research mentioned on the Business Insider website today found that increasing food and energy prices will be high enough this month to wipe out the positive effect on personal income of the payroll-tax withholding reduction that began in January for most U.S. workers. B of A estimates that the tax cut has raised take-home pay by about $8 billion per month, but this year’s food and energy price increases are now costing consumers about the same amount. The macroeconomic effect of this loss of discretionary income could be very important. Many anti-stimulus economists and politicians have raised the bugaboo that recent upward trends in many commodity prices are the result of “excessive money creation,” a thesis that is effectively challenged by this month’s San Francisco Fed Economic Letter, which uses a promising methodology to gauge the commodity-price impacts of a number of large-scale Fed securities purchases. (Warning: This is a fairly long and technical article for a noneconomist.) In addition, the S.F. Fed’s website also prominently features this interesting graphic, which shows that commodity price increases are likely to hit the lowest income groups hardest, since, for example, food purchases use up about 40 percent of the lowest income quintile’s pretax income, while household utilities account for roughly 20 percent and gasoline perhaps 10 percent of their income. Considering the enormous numbers of low-income households, it is would be very unfortunate if economists overemphasized the somewhat less relevant fact that food and energy costs now amount to a smaller fraction of total U.S. income than they did during the oil and food price shocks of the 1970s. Yesterday, corn futures prices at one of the main Chicago commodity exchanges hit a ten-year high. This is a frightening trend indeed. How many Americas are there? The new edition of The Atlantic contains this interesting map, showing how changing median incomes and demographics have divided the United States into 12 distinct geographic areas, each contributing to an overall picture of increasing economic inequality. (It may be helpful to use your browser’s “zoom” feature as you look at the map.) For example, our institute is located in a county described by the map as a “monied burb,” while I grew up in a county that the authors have labeled “boom town.” I would venture a guess that many readers who are familiar with these counties will be surprised to see how they are labeled. We take the new map and other efforts like it with a grain of salt, but as something to provoke thought about how things are indeed very different than they used to be.